The Brawlhalla Championship Series kicked off with a $1000 U.S. 2v2 tournament featuring an abundance of action packed games, upsets, and a Top 8 full of North America’s best 2v2 talent this past Saturday, June 18. The five hour long event was the highlight of the last week in Brawlhalla eSports with 135 team’s initially signing up to compete for the $1,000 prize pool. The rosters on these teams were full of both new faces, well known players, and some old faces from Brawlhalla history. With such a massive bracket to fight through a few relatively unknown teams rose to the top to give a great showing and shock everyone with their success. 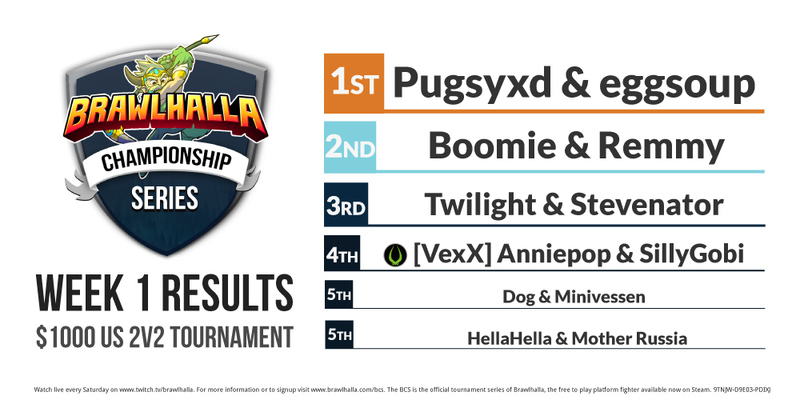 Boomie & Remmy took second place, losing only to Pugsyxd & eggsoup in both Winners and Grand finals. Top seed starting off was Twilight & Stevenator, who finished in a surprising third place despite largely being favored to take the whole tournament. They were knocked down to losers bracket during Top 8 by Boomie & Remmy and lost to them again in Losers Finals. Anniepop & SillyGobi of VexX Gaming finished in a solid fourth place, securing themselves a piece of the prize pool. However, the two teams tied for 5th both seemingly sprung onto the scene from nowhere, and surprised everyone at the BCS. Players HellaHella & Mother Russia of SOAP hailing from South California were at the forefront of a string of upsets, taking down well known players on the winners side of the bracket like the Frost|Logic and Orange B duo plus the eventual fourth place team Anniepop & SillyGobi. Eventually they ran headlong into the Pugsyxd & eggsoup wall who pushed them to the losers brackets, and fought their way to a 5th place finish losing out in the end to Twilight & Stevenator. Meanwhile, Dog & Minivessen put on a solid performance, also making it to 5th place. Their team coordination results in one of the only losses forced onto Pugsyxd & eggsoup during the tournament and Minivessen took three stocks off of [VexX] Anniepop & SillyGobi in a 2v1 situation. Many spectators wanted to know more about these new players on the scene, and we’re looking forward to seeing them compete again in future tournaments. You can take a look at the entire bracket from the Week 1 Tournament here. This weekend’s BCS event marked the starting point of the 21-week BCS tournament series. The BCS features 1v1, 2v2, and Regional Qualifier tournaments leading up to the Brawlhalla World Championship and Expo in November. For more information about the BCS, or to signup for the next tournament, visit www.brawlhalla.com/bcs.